A rare 60-year-old Macallan distilled in 1926 is set to be auctioned in New York this autumn, Sotheby’s has announced – just days after a similar bottle became a record-breaker. The Macallan 1926, 60-year-old single malt features a label designed by leading pop artist Sir Peter Blake, and is one of only 12 released by the Speyside distillery in 1986. Sotheby’s will offer the bottle at auction in New York this autumn, with a record pre-sale estimate for a single bottle of whisky of US$500,000-700,000. The sale of the bottle, numbered nine of 12, follows the auction of the eighth Peter Blake bottle by Bonhams in Hong Kong last Friday for a world record of US$1m (including 22.5% buyer’s premium). 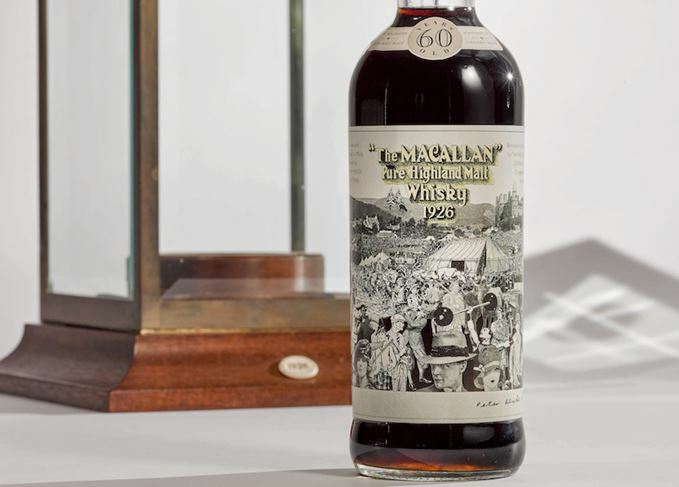 However, that record was broken a few hours later in the same sale, when another 1926 Macallan – one of another 12 featuring a label designed by Italian artist Valerio Adami – was sold for a total of US$1.1m. The auction came only weeks after Dubai Airport retailer Le Clos sold a pair of Macallan 1926 single malts – one each of the Blake and Adami labels – for US$600,000 each.